Star Wars Jedi Challenges will be released on the 1st November 2017. Register your details for pre-order alerts. Also like our Facebook page and follow our Twitter page for additional alerts. What is Star Wars Jedi Challenges AR Headset? Become a Jedi master and immerse yourself in the world of augmented reality with the Lenovo Star Wars: Jedi Challenges Augmented Reality Headset. Compete in epic lightsaber fights with bad guys like Darth Vader and Kylo Ren. The bundle comes with a headset called Mirage, a lightsaber and a beacon to place in the room in front of you. You will now need your mobile phone to download the game and place it inside the headset within the phone tray. It works by combined tracking of two cameras on the Mirage headset, the beacon and blue lightsaber. The beacon requires 2xAA batteries and the lightsaber comes with it's own rechargeable battery. Where can I find Star Wars Jedi Challenges Headset stock? Use our unique stock listings to locate stock as soon as it becomes available at our panel of top UK retailers. Our servers are constantly checking for stock to ensure you are the first to know when availability is found. During busy periods Star Wars Jedi Challenges Augmented Reality Headset stock can literally sell out in minutes, it is therefore crucial you know quickly when stock is available to buy before it sells out. We constantly check for Star Wars Jedi Challenges AR Headset stock, so you don't have to. 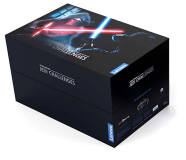 Receive email alerts when Star Wars Jedi Challenges AR Headset online stock is found.